Today we head back to the Icefields Parkway in Banff National Park, Alberta. 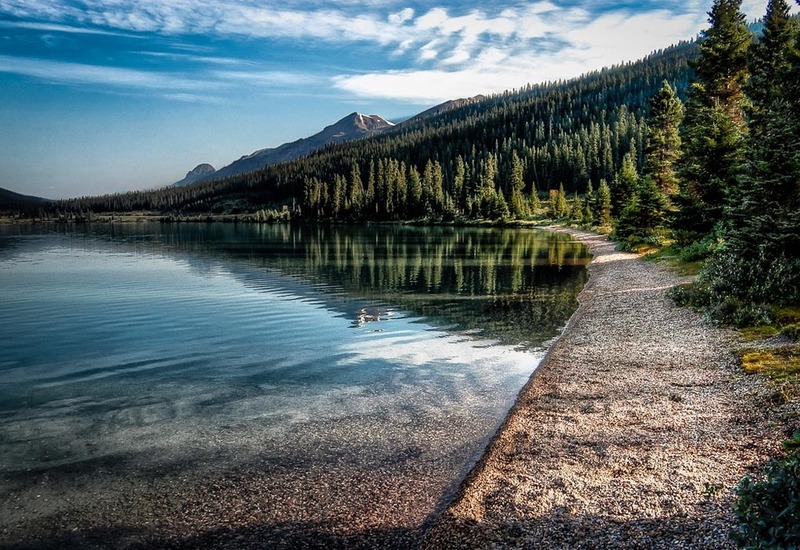 There are so many lakes that can be explored along the road that if you stopped and explored each one, it would take days to drive the 140 miles. One lake that must be explored is Bow Lake. It is a relatively small lake at about 1.25 square miles so it can explored in a short time. It is home of the Crowfoot Glacier and the old quaint lodge, the Num-Ti-Jah Lodge. As can be seen in this image, there is a decent gravel path that borders part of of the lake. The road is only about 30 yards from this spot and the rising sun cast beautiful light through the trees onto the lake.